Currently Adobe PDF may be the most popular document format on the web Now a days ebook lovers prefer the ePub format over PDF. The main difference between epub and PDF is that PDF documents have a static layout with fixed page but the layout of an ePUB document is “responsive” meaning it will automatically adjust for different screen sizes. We can read an ePub book on your desktop or inside the Google Play Books app on your Android phone and they’ll look good. Also, since ePub files are essentially HTML5 documents under the hood, the text size and font family can be easily adjusted for an improved reading experience. There are various Free Apps like Adobe Stanza and Calibre are popular desktop software for creating ePub ebooks. 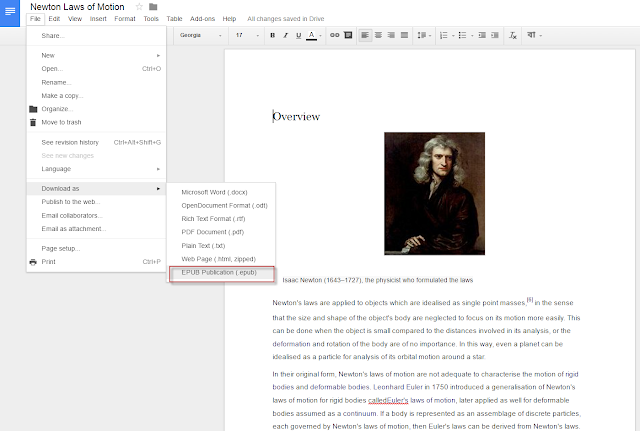 Google Drive provides interesting feature in the browser using Google Docs itself. All you need to just compase a document in Google Document, or upload an existing Microsoft Word file to your Google Drive, go to File menu and choose download as EPUB publication. We get an ePub file that you can copy to your mobile phone or,which can be uploaded the ePub to the Google Books website and access the ebook from anywhere. You can even read it in the browser. ePub files are readable on iPad, Nook and Google Play books but Amazon Kindle doesn’t support the ePub format but you can convert ePub into MOBI format that is supports Kindle.